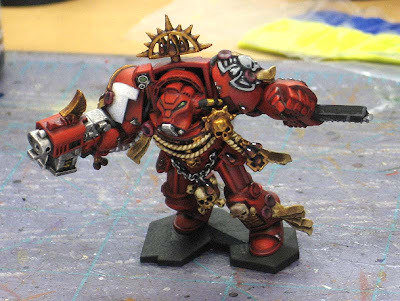 Since I've finished all the Genestealers, I've started work on the Blood Angel Terminators. Even though there are fewer of them, they've got tons more detail on them and go just as slow. I decided to include a comparison shot of a previous Terminator I did for my FLGS. I'm constantly amazed at how much my painting has been improving over time. Now it's really HOW I use them (washes) on models that I'm developing. Gone are the days of just washing the whole thing or basically "dipping" the model. While it works, I'm learning you can get far better results with a more controlled approach. I'm also learning to mix and match washes in key areas to get the results I want. It's opening a whole new realm for me. Wow, it looks great matey. I hope I can make it to that kind of standard one day! Great work! I think the bolter casing looks a lot better black but apart from that the new one is lovely. Maybe add some test to the purity seals though. Absolutely stunning work Ron, as always of course! I love the richness of the red, without it becoming too much (thanks to the added chips and damage). Hephesto: I'm happy that I've been able to get the "richer" red with the model this time around. Finding that right technique has been a challenge.